The frames were perfect for my nursery wall. Easy to assemble and great price! The frame turned my tea towel into a piece of art. Easy to assemble from start to finish! It is a little warmer than other silver frames and I like that. Lately all my metal frames are coming with dark oil or grease on them that I have to clean off. Love this frame. Needed a very "minimal" look for a new series of paintings. 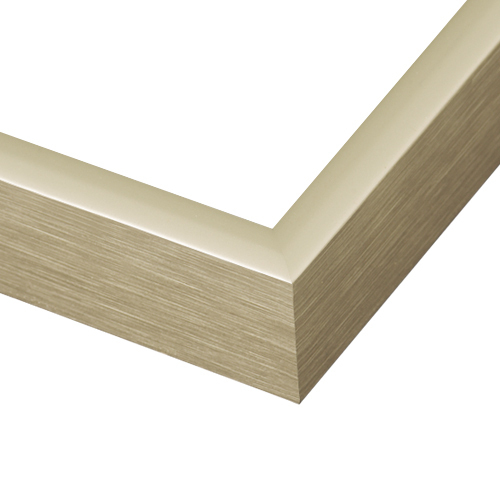 This frame practically disappears but lends a nicely finished, and soft look to the work. And so easy to assemble. Would, most definitely, recommend it. The color is great, they were very easy to assemble and hang! Was able to get custom sizes to fit my cross-stitching at a good price. 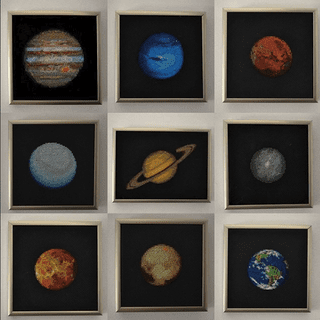 Hung my planet cross-stitches in this frame! I am using the frame for a tea towel that was a gift from England. I have used these frames before as they are perfect for showing many of my watercolors in galleries, most of whom require a simple frame with a clear Plexiglas f ace and foamcore backing. I chose this frame because I wanted a simple modern look. This color is like a "warm silver" it's like silver with a like gold tone so it's perfect to go with both silver and gold decor. GREAT COLOR AND PRICE FOR SHOW ENTRY! Hi there, I have a bunch of photos to frame, is there any discount for ordering 10 or more frames of same size? BEST ANSWER: Hello Rae. We do not have a quantity discount, however, we do have promotional codes you may use on your order! If you need further assistance, you may call our customer care team at 1-800-332-8884. Happy Framing! I don't think there is a volume discount, but if you are a professional artist you can become a pro member and get 25% off all your orders.